On June 2nd, from 6:30-9pm, the new Gallery at Main will host an inaugural exhibit, Constructed, showcasing work by the artists whose public art has been incorporated into different Richland Library locations. The gallery is located inside the Richland County Public Library at 1431 Assembly Street. 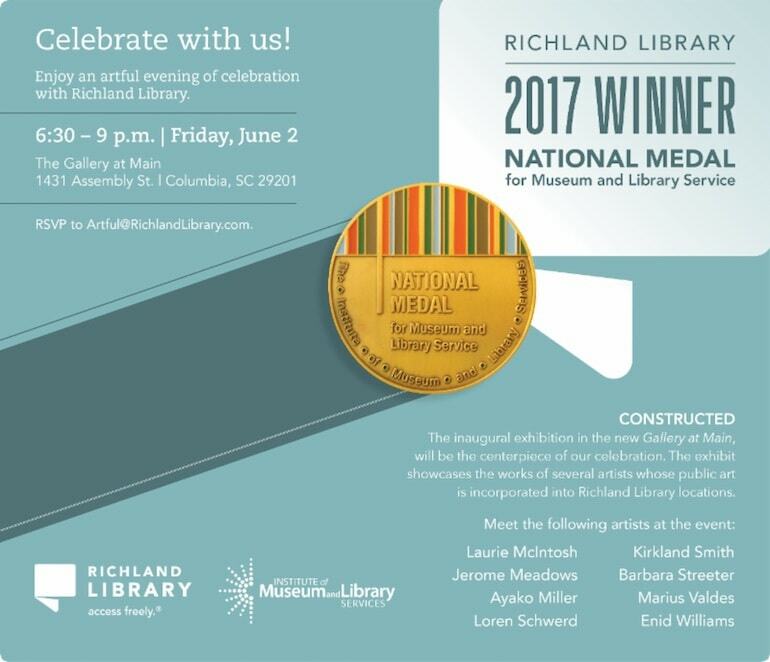 The Library has recently been honored as the National Medal Winner for Museum and Library Service. Other artists included in the show are Laurie McIntosh, Jerome Meadows, Ayako Miller, Loren Schwerd, Barbara Streeter, Marius Valdes, and Enid Williams. I will be including the study I created for the triptych still in progress at the Sandhills location. The show will remain on display through August 4th. In November 2013, Richland County residents approved a $59 million bond referendum to assist Richland Library with renovations, with each location going through a multi-year process of design, planning, and construction. For each library, 1% of the construction budget went toward public art. Inspired by the library’s brand promises, artists were encouraged to serve the public good and nurture communities. Although renovations are on-going, several branches are completed and artwork has been installed. The show at The Gallery At Main will highlight each artist’s style of work, representing the art on display throughout the different library locations.